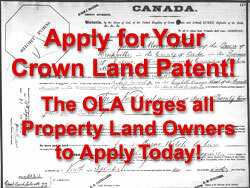 The Crown Land Patent Grants are contracts and are Letters Patent. There is nothing Constitutional about the Patents, they are based in contract law and are regulated by common law. They are a contract between the Crown, the Grantee/Patentee, their heirs and assigns forever. A patent, it would seem, of any kind usually has a time limit and the time limit for the Crown Land Patent Grants is “forever”. To use the words of Nick Vandergragt, radio talk show host, “forever hasn’t happened yet.” These documents, at the time of construction, were also, it would seem, Acts of Imperial Parliament and have specific “reservations” reserved to the Crown, the Crown’s heirs and successors. These reservations can include: mines or gold, mines and minerals, navigable water-ways, white pines, etc. They are also your property rights as after 60 years of adverse possession from the Crown, the Crown has no right, title or interest in the lands conveyed. That is to say the property that one owns, it would seem, is not subject to the whims of the Crown. This 60 year adverse possession is governed by the Nullum Tempus Act of 1769, which governs the Crown’s 60 year prerogative. In this act the Crown was made to set a specific time limit on how long it could take the land back to itself to be re-granted. The King, of the time, had a habit of granting land and when the landowner fell out of grace with the King, the King would simply come up with an idea and take the land back, leaving the property available for the Kings new favoured pet, sound familiar. The reversal and voidance of any reservation must be to the advantage of the Grantee/Patentee as expressed in a number of court cases and Royal Proclamations. On a statement of a fellow that approached his lawyer, in regards to applying for a reversal of a reservation, it would seem, he would be re-negotiating his “contract” and may become subject to the legislation of today. For this reason, it would seem, to side on the side of caution, people may want to rethink applying for a reversal or voidance of a reservation at this time. Ontario is a Common Law province and yet our legislators are treating this province as if it were ruled by Civil Law. And if a neighbor has a situation with his neighbor, he has the option of launching a tort. There is confusion as there are two types of Civil Law. One being statute law, the other being private law. Private civil law, between two people is the right to launch a case in a court of civil/private law. They are still a contract and they are still patents and they, it would seem, are still private property rights. Without the knowledge of these documents people, through the generations, have been denied their rights and the right to use whatever means possible to defend their ownership. It had been so engrained in people that they had property and land rights, that they had become complacent and allowed themselves to be governed by legislation that did not pertain to them. They owned their land, they owned their property and unless there was a successful application to the courts, in regards to regulating the right, title or interest of the land and property, no second or third party had option of dictating to the owner of the property, including the land use conditions, unless specifically expressed in the Letters Patent. We hope this clears up any ambiguity as to what the Crown Land Patent Grants are and how legislation, it would seem, does not apply to privately owned land or property. It is up to the people to stand up for their rights, exercise their rights and to instruct their elected officials as to what they will and will not accept. It is also the duty of each individual to respect the rights that the Crown Land Patent Grants afford, and to accept their own individual responsibility that come with those rights.